What if the person you had been dreaming of since you were a child, was real? Running a kingdom is never easy, especially when you are new to it. When her father falls ill, KyLaya Constantilly is left to lead the kingdom of Triton, an underwater kingdom at the heart of Mer. She thought her job was hard, but when she finds herself at the mercy of a deadly Siren she realizes just how dangerous it is too. When a handsome stranger saves her from a fate worse than death, KyLaya is whisked away from all she knows and into the clutches of a Sirenite, a Siren’s son. But, when he turns out to be the guy that she has been dreaming of since she was a child, KyLaya’s heart is put to the test. Will KyLaya be able to open herself up to love, or will she remain faithful to her people and the engagement to a man she could never fall in love with? Jett has one rule: never engage a Mer. But that is about to change. Growing up on the prairies as a part of a small, tight-knit, community Jett’s life seems charmed. However, there is more to his people than meets the eye. Refugees from Mer, his people have hidden away from the sea and kept to themselves for generations. Staying away from the Mer is his people’s number one rule; until the day he sees KyLaya for real. When her life is put in danger, Jett reacts without thinking, betraying the very laws and people that he is charged with protecting. Will Jett betray the confidence of his people to remain with the girl who has graced his dreams since he was a child, or will he turn her over to his people and certain death? Can KyLaya and Jett set aside the fear and prejudice they were raised with and allow themselves to be together? Or, will their people’s laws and rules ruin a love that has made their dreams come true? 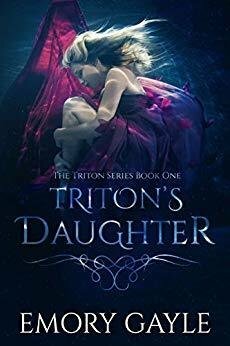 Taking place in the same world as The Water Series, Triton’s Daughter brings to light another part of Mer and a side to its people that has yet to be seen. A whole new cast of characters, locations, powers, and gods awaits in this romantic and action packed first installment!